The City of Edmonton, Edmonton Arts Council, and Audreys Books are pleased to announce the shortlist works for the 2018 Robert Kroetsch City of Edmonton Book Prize. 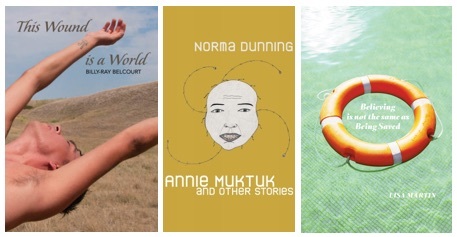 The three finalists include Billy-Ray Belcourt for This Wound is a World (Frontenac House) Norma Dunning for Annie Muktuk and other stories (University of Alberta Press), and Lisa Martin for Believing is not the same as Being Saved (University of Alberta Press). The Robert Kroetsch City of Edmonton Book Prize was established by the City Council in 1995 and is administered by the Writers’ Guild of Alberta. The prize was renamed in 2011 after the late Robert Kroetsch, who was best known for his Governor General’s Award-winning novel, The Studhorse Man. Entries are judged by an independent jury recruited by the Writers’ Guild of Alberta. The winning author will receive a $10,000 cash prize. The award is sponsored by Audreys Books and the Edmonton Arts Council. The winner of the 2018 Robert Kroetsch City of Book Prize will be recognized at an awards presentation in June of this year. Please join us on Sunday, May 6th, 2 pm at Audreys Books for readings by this year’s shortlisted authors!